Well- seems like I only blog on Tuesdays- but hey! 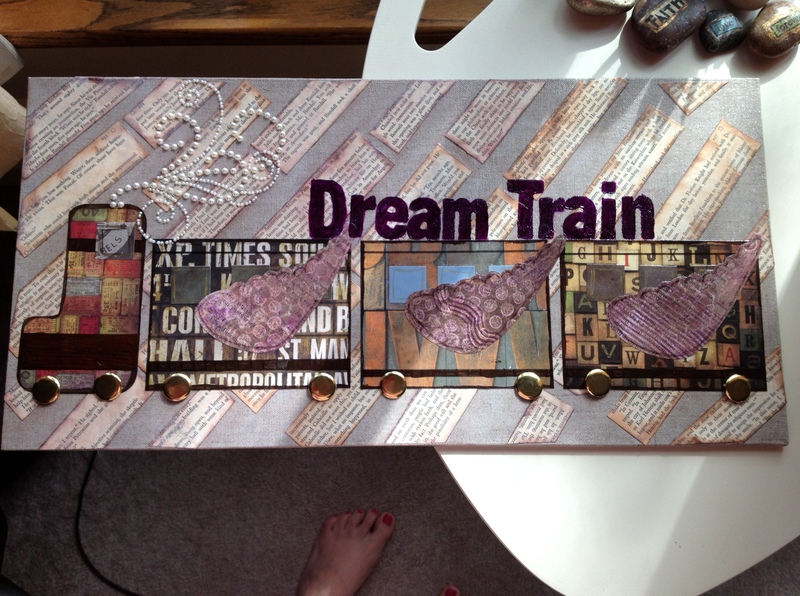 At least I am blogging AND more importantly… creating! This weekend was Art-A-Whirl in my neck of the woods. The country’s largest Art Crawl. Hundreds of artist’s open studios and galleries open to the public all weekend to promote and support the arts. The neighborhood (Actually a conglomerate of very closely knit neighborhoods) I live in is considered the Arts District of Minneapolis. It’s pretty cool. We got out with both the Big Kids at different times over the weekend to tour some of these warehouses with open studios and see a ton of amazing and some pretty crazy- art work. There is also awesome food trucks and great live music all weekend too! I planned ahead of time to take advantage of the creative vibe that would be going on all weekend- and hoped to get at least two pieces done… and I did! YAY! This is a canvas board and for a few projects I used it to wipe off my paint brush and stencils etc. It made such a pretty background. I wasn’t sure what I wanted to do with it- so it has been sitting on a shelf with my supplies. Lately- I have really been learning how to TRUST the Lord for managing my life and my dreams. It has been a really incredible journey and I felt like I wanted to kind of commemorate this time of my life in my art- so this piece was born. I had originally thought I would do a longer quote- but with only one pack of the letter stickers I wanted to use- and those being already open… LOL This was the phrase my husband helped me come up with to still convey the message- but use the letters I had on hand! I cut out the butterflies from printed clip art. Then I covered them in Art Anthology Sorbet- a clear glittery paint. (You can’t really see the glitter in the photos.) As they dried- they curled naturally and I also kind of helped form them so they would have more dimension when I added them to the page. I added split peas for the bodies and painted them coordinating colors. 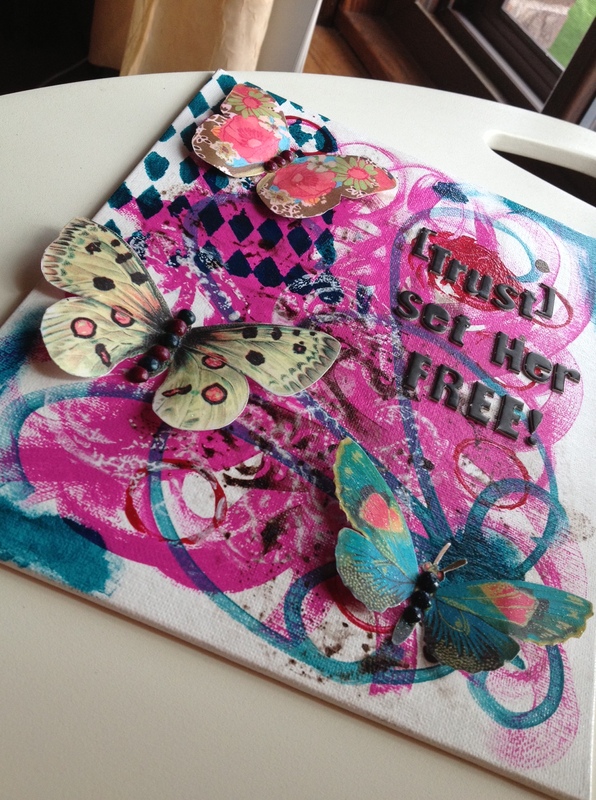 I knew I wasn’t going to be able to seal the whole thing with the butterflies on it- since they needed to pop off the page- so I started to decoupage the canvas with a nice glossy medium- but realized that some of the color I had used (the brown and some of the white) were “washes”… water with a little paint mixed in- so using brush strokes was smearing the color… so I ended up using a styrofoam brush to dab all the decoupage on to seal that color in carefully. Once it dried, I did it again with the brush. Then added the stickers and butterflies. I am really pleased with how this came out. It’s a little busy but it makes me happy! It was important to me as part of this piece, that everything be text-based (after all what are dreams but visual words?!) So the background is pages of a book pulled out, cut and inked on the edges (I have two altered books I have done pages in and keep around for this exact type of purpose.) 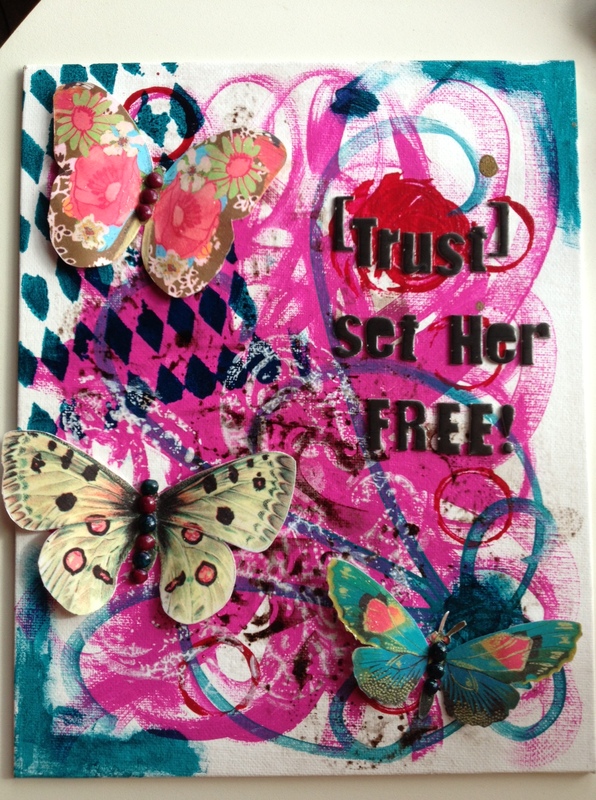 The wings are the same paper- with a Gelli Plate background on them. (THAT was fun! 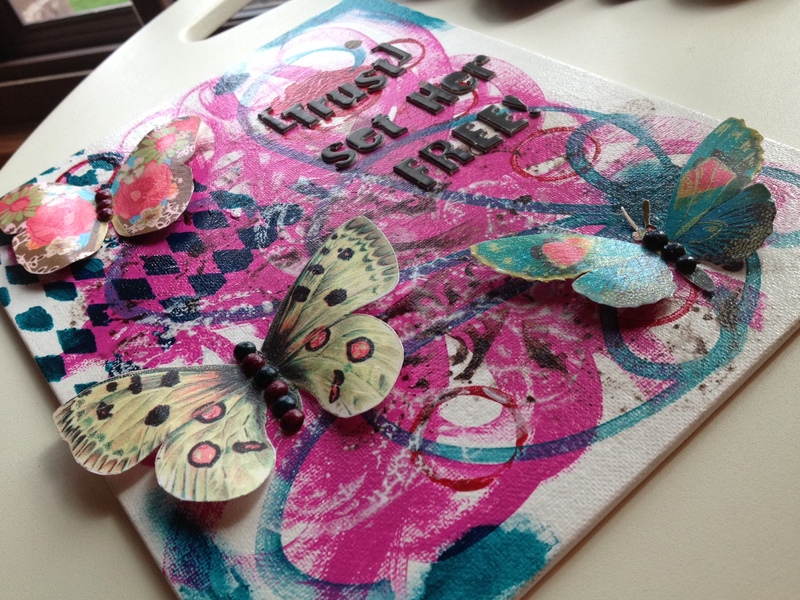 I have been watching videos and tutorials on using the Gelli Plate.) The scrapbook papers I used all have text on them as well. I wish I had made the “engine car” with more of a triangle on the front (the cow pusher thingy) so it looked less like a cab of an 18- wheeler and more like a train engine- but hey- it’s my first train! I love the pearl smoke! That worked out great! So glad I remembered that I had that sticker! What’s on YOUR table today? Both are great projects for canvas board, and you have completed them beautifully. Especially love those text pieces for your background on the second piece. Well done! Thanks Kay! It was fun to use all text! So beautiful, I love how a canvas hat began as a run off piece turned into something so pretty, it morphed just like the butterflies on it. Serendipitious!! You are so lucky to be living in an art district too!! Thanks! The butterflies are turning into one of my favorite pieces in a while!